Typically, standoffs are used for installations on tile, shake, or special thick composition roof types. As a general rule, standoffs should be approximately 2½ inches taller than the cone of the flashing selected for the roof type. The location of attachment points for standoff mounts depends on the orientation of the modules relative to the rafters. Using the array layout plans and the estimated rafter locations, determine the location of all attachment points and mark the holes for each standoff base. Remove the tile or shake underneath each standoff location, exposing the roofing underlayment. Transcribe the location marks from the roofing material to the roofing underlayment. Ensure that the standoff base lies flat on the underlayment, but remove no more material than required for the flashing to be installed properly. Use the standoff base as a template to mark lag-bolt hole locations on underlayment above the center of the rafters. Confirm the location of the rafters by drilling pilot holes into the roof at each of the identified attachment points with a 3/16-inch pilot drill. Be sure to drill the hole deep enough to penetrate the roof decking and enter the rafter by 1 inch to 1½ inch. If the drill pushes through at this point, you have likely missed a rafter and should move ½ inch laterally toward where you estimate the rafter to be and try again. Prior to securing the base to the roof, insert the 5/16-inch x 1-inch bolt and lock washer through the tapped hole in the standoff base and tighten. Make certain you use the correct part for the type of roof on which you are installing the array. Apply a bead of sealant to the underside of the standoff base and into the pilot hole. Secure base to the roof by screwing 5/16-inch lag bolts with lag bolt washers into the pilot holes and tightening with a ½-inch socket and socket adapter bit in a power driver. Make sure the lag bolts used are long enough to embed a minimum of 2 inches into the rafter to secure the standoff base to the roof. If the bolt spins out, you didn't hit a rafter. Move ½ inch laterally toward where you estimate the rafter to be and try again starting with a new pilot hole. Most wooden rafters are only 1.625 inches thick, so you should always attempt to hit a wooden rafter in the center if possible. Screw standoff shaft onto the base and tighten. 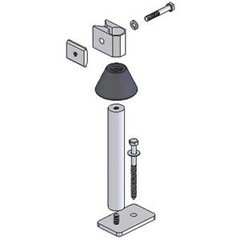 Install flashing over the standoff shaft and base using standard building practices. Apply a bead of sealant to seal the top of the flashing around the standoff shaft. Slide rubber rain collar over the standoff and press down to cover the sealant at the top of the flashing. Every standoff must be firmly secured to a rafter to ensure system integrity. Make sure that all lag screws are securely tightened into roof rafters and are structurally sound. SnapNrack offers a variety of roof attachment components. Some may be used individually, while others require a combination of components. The flashed L-foot is recommended for simple flush mounts to a roof with composition shingles. Roofs with tile or thick roofing material will probably require standoffs. The Corrugated Roof Block allows attachment of the L-foot directly to structural members covered with corrugated metal without collapsing or crushing the ridge in the roof material. The Hanger Bolt Clamp allows a versatile installation on roof surfaces which won't allow L-feet or standoffs. Configuring tilt angles from 0 to 10 degrees simply requires SnapNrack standoffs. A 5-1/2" standoff on the lower rail and a 7" standoff for the upper rail allows adjustability for shallow tilts. For angles from 10 to 45 degrees, use standoffs for both upper and lower rails, then extend the upper edge with sections of rail cut to length and drilled with two holes. Tilt leg rails can be cut and drilled in advance to save time on the job site. A simple drill guide will help with locating the holes in the tilt leg. If the length of the cut-rail leg exceeds 4 feet, consult a structural engineer before proceeding. SnapNrack standoff spacer - 1"
SnapNrack standoff - heavy duty 7"
SnapNrack standoff - heavy duty 12"
Oatey flashing #11830 12" x 8.75"
Oatey flashing #11831 18" x 18"